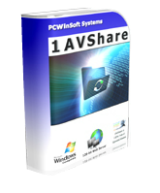 1AVShare is a Windows application that allows you to share your files with trusted users or access them remotely from anywhere. Securely share photos, videos, music and documents over the Internet. Logged users can view, download, search files and even upload files. All anyone needs in order to access your 1AVShare server is an internet browser, that’s it – no other software installation is required! Once you install 1AVShare, you’ll have an embedded web server of your very own that resides entirely within the confines of your computer, protected by 128 bit security. Just configure user accounts for anyone that you want to have access to your files, and you’re good to go.